As far as we as FOSRESTBundle integrators are concerned, so long as we wrap our data - entities, arrays, even Symfony's Form class - FOSRESTBundle can handle the process of serializing the data for us into JSON, or XML, or any other format we have configured. This is awesome. This is a solid example of how using FOSRESTBundle for your Symfony 4 JSON API is going to save you a bunch of time. But, also this won't just work right out of the box. And as we have covered, this will be combined with the default configuration to come up with the active config that FOSRESTBundle will use when handling incoming requests. The problem right now is that we have not provided any more explicit configuration, and so we're falling back to the defaults. Currently we're throwing a 500 error. As we haven't configured our setup and further, we're falling back to HTML. 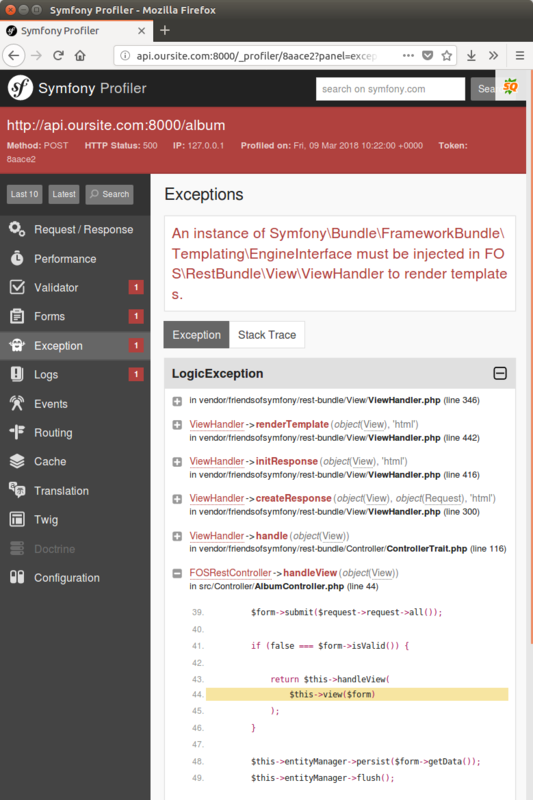 For a HTML response FOSRESTBundle wants to use Twig. We actually do have Twig installed - implicitly - because we composer require profiler-pack. However, templating is not enabled explicitly in our setup. 'Unable to find template ""' being the interesting information. But we don't want to work with HTML, so get rid of that framework.yaml addition, if you added it. FOSRESTBundle comes with a FormatListener which allows our API consumer to send in data in any format we support, and the normalization process will be taken care of for us. Our API can handle both. In order for this work, we need to configure the format_listener with some rules. This rule saying that for any path starting with a slash (aka any path at all), then we will accept either XML, or JSON. We won't allow the user to choose their return data type, however, we will always return XML. Also, we could switch the priorities round and always return JSON. If doing this, update the fallback_format to json also. As a heads up, we haven't implemented the GET request just yet. This is a preview of what's to come. Here we fall back to the default - xml - because no extension was requested in the URL. This is pretty cool - we can support POSTing in both XML and JSON, even though we don't really truly care about XML. It's a nice bonus. You can confirm this for yourself by looking at your database. There should now be 4 records in your albums table. The three from the Background, and the new one you just successfully posted in. At this point our error checking tests will be failing. This is expected. The representation FOSRESTBundle returns, versus the JSON we expect is slightly different. Not to worry, we will fix this, but first we will finish implementing the happy paths.